The 2008 Drum Corps International World Championships came through Indianapolis this morning for the Individual & Ensemble Competition. During a media event prior to the start of the competition, DCI Executive Director Dan Acheson presented the ceremonial Trumpet of Champions to Indianapolis Mayor Greg Ballard before the commemorative icon made a speedy exit in an IndyCar en route to Bloomington for the remainder of the World Championship events. Local celebrities then got the chance to pit their percussion skills against the reigning World Champion Blue Devils drum line in the first ever "Indy Drum Off." Drum Corps International kicks off big event WTHR Channel 13, presenting sponsor of the Drum Corps International World Class Semifinals, was there to cover the event, and got some video of their own from the drum-off. 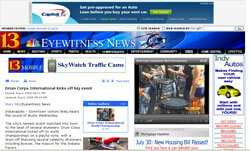 Check it out at WTHR.com.